We have a few reminders for the day to keep things flowing smoothly. There are nearly 125 vendors coming, so we ask you to bear with us as we deal with any hiccups that may arise during the day, particularly the check-in process. Booth Size is 10X10. Canopies must fit inside a 10×10 space. Be sure to check the size of yours to make sure it will fit, as some are bigger and will not fit. 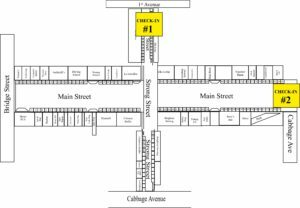 Each vendor is required to provide all necessary tables and chairs – canopies are recommended. Check in for the event is 9am-10:30am. (8:30am-9:00am for Food Vendors) There are TWO check-in points. One at the Northwest corner of 1st Ave and Strong St. and One at the corner or Main St. and Cabbage Ave. If you are checking in after 10:30 you will go to Creative U at 43 N Main St. to check in. If you are not checked in by 10:30 you will not be able to drive to your space and will be required to walk your items in from the closest parking lots. If you do not show up for the event, you will not be invited back to another event. No shows will not be tolerated. If you are sick, please contact one of your vendor coordinators. You will be allowed to drive your vehicle to your space and quickly drop off your things and then move your vehicle to the closest parking lots. We will have some volunteers on hand to help you unload your items from your vehicles. Do not set up tents or canopies until your vehicles have been moved. Please pull your vehicles as far to the right or left before unloading to allow other vehicles to pass you. Don’t forget to bring extra people with you to help – it gets crazy! The use of speakers, sound systems, microphones, etc is strictly prohibited unless prior permission has been granted. There is no electricity available for any of the vendor spaces. Small, generators are allowed, as long as they are not too noisy and don’t produce a lot of smell or fumes. This is an outdoor event. Be prepared for cold, snowy or rainy weather. The weather often changes quickly. The event will not be cancelled unless the conditions are too bad to hold the event. In the event the event is cancelled you will be contacted as soon as possible. Refunds cannot be given if event is cancelled. Vendors are allowed to do a “soft pack up” starting at 3:30pm. This means back stock and extras can be put away and you can start preparing to pack your booth. You may NOT take down your signs, or the bulk of your inventory. Your booth must still look like a functioning booth until 4:00pm. Vendors have 45 minutes to pack up their booths and clear the streets. The event takes place on city streets that will be closed to traffic. We have a time limit and the streets have to be re-opened promptly after the event. We cannot open the streets to drive vehicles to the booths, until the pedestrians have cleared the streets. Please plan accordingly. This is to allow extra time to get you smooth passage through our tiny downtown streets before they fill up with all of the many canopies/vehicles and bodies. You will arrive on a 1st come/1st parked basis and set up on the side of the street appropriate for your serving window to be facing the inside of the street. 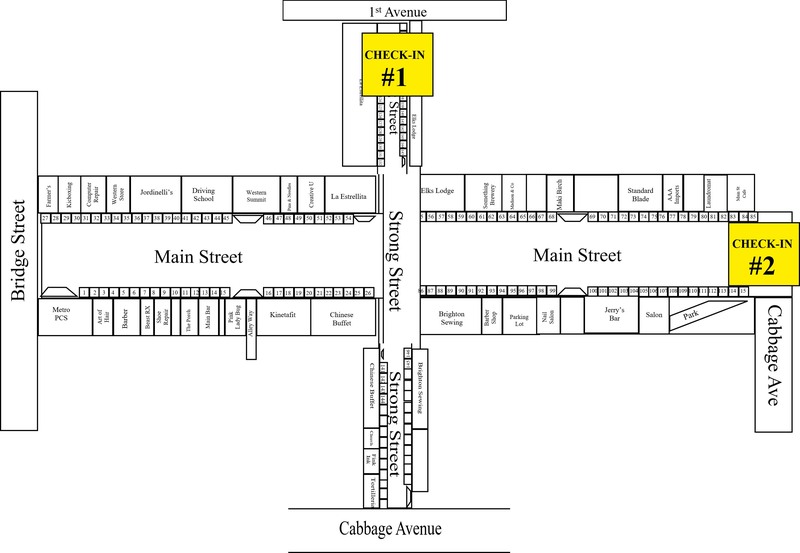 Food Vendors are located on Strong Street on the East side of Main Street and should check in at the corner of Cabbage and Strong Street.